Does anyone actually "celebrate" Earth Day? It was a big deal when it was first introduced, when I was in high school. April 22 was also my mother's birthday. Happy birthday, Mom. 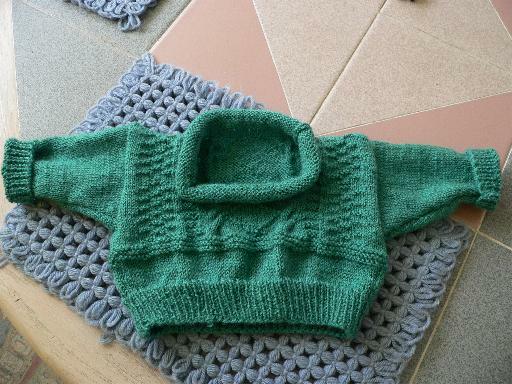 I finished Lorelai's green sweater. It's cute but it had its share of problems. A bit of advice. Never start a project, leave it a couple of years, then pick it up again and try to change patterns midstream. It causes havoc. It's done, though. I hope it fits for a little while! I also made a poncho for Lorelai. A couple of years ago, I was beta-testing a computer program for designing knitted and crocheted items. All of us testing the software would design various projects and knit/crochet them and see if the designs worked up as they were intended to. We all wound up designing children's clothing because we could finish them quickly and see the results faster than if we made adult size garments. The software works great, by the way, and I highly recommend Knitware. Anyway, at that time, I made all these little things and gave them to Kim to give to Carl's niece, Corie. One of the things I made was a little mini-poncho. Kelly loved this thing. 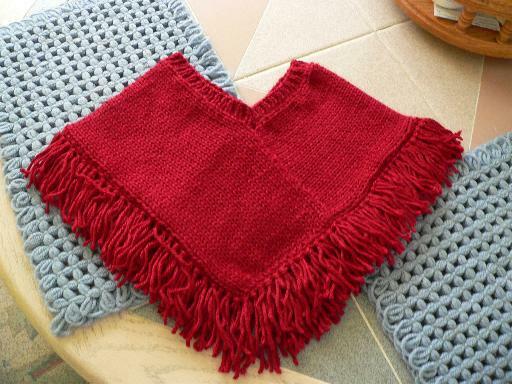 So, when I started making things for Lorelai, the one thing she requested was a poncho. I finished this one yesterday. Isn't it cute? The sizes run in baby's weight so this one is for 18 pounds, which we estimate to be a size six months. I'm hoping she can wear it for the spring and the fall. Incidentally, the color is actually a bit darker than it shows in the picture. The color is called wine. Lorelai really seems to respond to the color red so when we looked for yarn for this poncho, we kept showing the yarn to her to get her reaction. When she saw this color, her eyes got really wide! We found a winner! Now, I'm working on a cotton garter stitch bib. With all the drooling she's doing, the terrycloth bibs are soaked so quickly. I'm thinking the knitted cotton bib might absorb more. We'll see how that works out. When I'm done with that one, I'm starting a pair of socks for my hubby. After those are done, I intend to finish the socks and sweater I started for myself before starting any more projects. I do have a beautiful sweater started for Lorelai but she won't fit into it until she's around 2 years old so I think I can wait on finishing that one. It's a dreary day but we really need the rain so I won't complain. We've had some beautiful, unseasonal weather lately but you knew it wouldn't last! It's still early in the season and we're not ready for air conditioning yet. It's really good! I also made an old favorite, the weight watcher key lime pie. Lorelai got lots of goodies and was very well-behaved, although we couldn't get her to take a nap at all. Too much excitement. She was still smiling by the end of the festivities, though. I'm off today but I'm not sure about the rest of the week. My student is going to a family wedding but he wasn't sure when they were leaving. I hope he lets me know! I actually have an ASL beginner class starting this Wednesday with 7 students. That's pretty amazing. So, I have to get my materials out and go over them. It's been raining on and off all day. I hope the weather clears for Sunday. 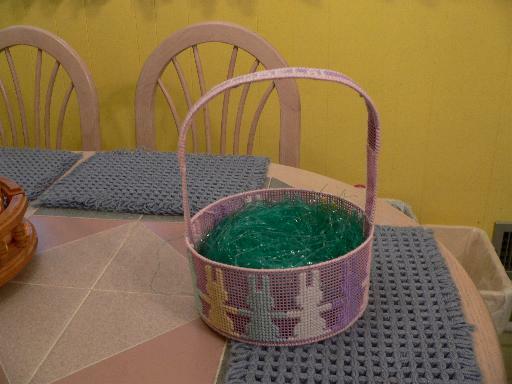 I've been working on getting things ready for Easter and spent a good part of the day finishing Lorelai's Easter basket, the one the bunny will give her (aka Mom and Dad). It's been awhile since I made one of these. 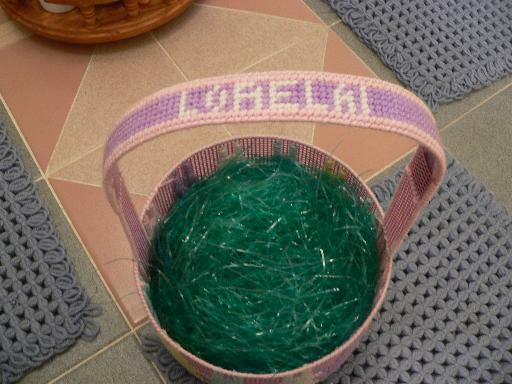 All three of my kids grew up with baskets like this one. I actually only stopped using the baskets a couple of years ago. 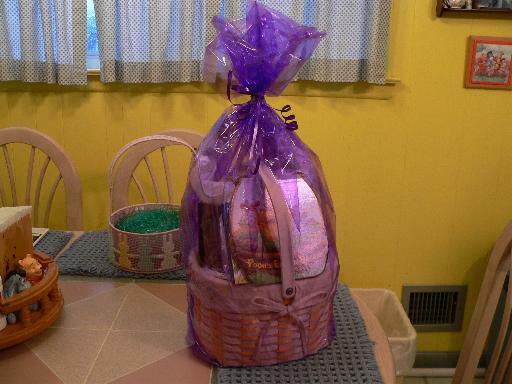 Here's Lorelai's basket from Nana. Me? Go overboard? Whatever made you think that? A couple of weeks ago, Sue and I took a ride into the city to see a production of Children of a Lesser God. It was really good. The actress playing Sarah and the actor playing Orin were both in the Roundabout production of Big River. The story is actually a bit different from the movie version. Most of the speeches are the same, just delivered to different people. The story of the relationship between James and Sarah remains much the same, though. We also interpreted Smokey Joe's Cafe recently at Smithtown. We haven't had a deaf audience in several shows. Sometimes, we get students and often, they are there to fulfill requirements in their classes and Sue and I actually have to sign off on their appearance there. But we haven't had any deaf audience members in a while. So, naturally, we didn't spend a lot of time studying the lyrics of the songs or practicing them for long periods of time, as we did in the beginning. You start to get a little complacent. And what happens? You guessed it, we had three deaf women. I was a little surprised since I didn't think this was a show that would necessarily attract a deaf audience. They bought the tickets online. Because of a mixup in the order of the songs, it turned out that Sue and I wound up preparing the same songs for Act 2. So, during intermission, we had to scrounge up a copy of the score so we at least had the lyrics in front of us, although we hadn't prepared the songs at all. We did fine, though. We got through it. Maybe next time, we'll work a little harder! In May, I believe it's May 22, Sue and I will again interpret readings in Manhattan so if anyone's interested in seeing interpreted performances of original readings, I'll be sure to post information when I have it. It was so nice having this past week off. I didn't really accomplish a lot around the house and still have a bit of cleaning to do tomorrow but I was able to work on some craft projects and spend some time with Kelly and Lorelai so that was nice. I also have Monday off. My student is going away for a family gathering sometime next week so I'm not sure when I'll be working. He might be there Tuesday and Wednesday, maybe just Tuesday. I asked him to let me know. I bought some yarn to use to make Lorelai a poncho on the knitting machine so maybe I'll have time to do that next week. Good morning! I can't believe it's this far into April and I haven't been here to change the month. I must apologize. I guess I've been really busy. I see that after St. Patrick's Day, the spirit didn't move me to post anything more for the month of March. Geez. I promise to do better. 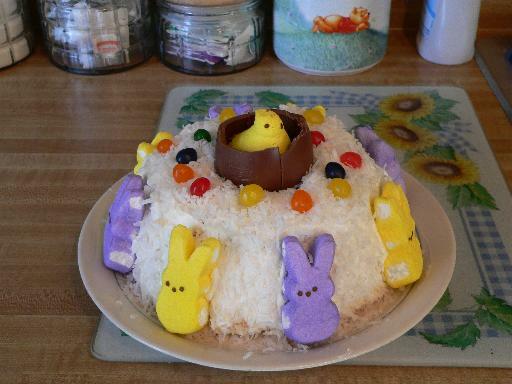 I'm on vacation this week, the week before Easter. I'm relaxing now. I really have to clean. I let all my weekend chores go and just hung out since I'm off this week. We spent yesterday with Lorelai. She's really becoming so alert and aware. She's smiling all the time and I swear she's working up to a great big belly laugh soon. She sometimes smiles so wide, her eyes close and she looks like she's really going to laugh. So cute. She's also growing so fast. She's 10 pounds, 9 ounces and 24 inches now. And, she's teething. She seems to be handling it well, though. She's drooling and biting but not complaining too much. The weather is finally warming up a bit. Even though it was a pretty decent winter, I'm still tired of the cold. A little sunshine is welcome. It looks like it will be in the high 50's, low 60's this week. Not bad. 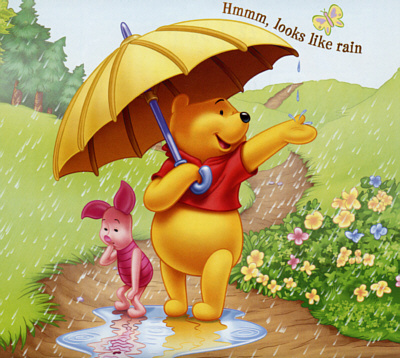 The very beginning of April looked like Pooh's picture above, rainy. Well, April showers bring May flowers, isn't that what they say? I haven't been reading much lately. I've been knitting a lot, though. I'm trying to finish everything I have going before I start anything new. It's been really hard to do that! There are things I'd just love to start but I should be more disciplined than that. I may do a couple of knitted bibs in the midst of all this stuff, though. We'll see. I have to buy the cotton yarn first. I'm close to finishing the dark green sweater since Lorelai should fit in it soon. I'll probably finish my socks after that. I'll try to finish the smaller things first. I did manage to read the book Speak recently. It was really good. I have a whole stack of books I want to read. I'm trying to split my spare time fairly equally between knitting and reading. Well, I guess that's a decent start. Have a good day!